What comes to mind when you think about summer camp? Crafts? Canoeing? How about learning how to do a colonoscopy (on a model) or a heart ultrasound? 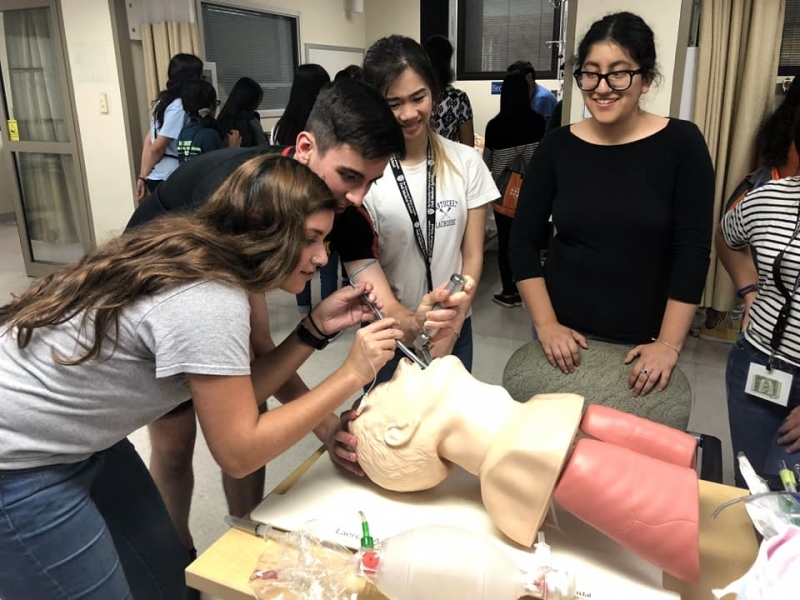 Those are just a couple of the activities students have experienced during Health Sciences Summer Camp at the University of Texas’ Dell Medical School in Austin. The camp will hold its fifth year of sessions this summer. The program doesn’t just give its participants perhaps the coolest “what I did on my summer vacation” stories ever. It also helps create a healthier future for Austin. And it’s just one example of how Dell Med has built a movement for innovative, community-focused medicine in just a few short years of existence. The Dell Med summer camp began in 2015, even before the medical school welcomed its first class of students. This summer, it will offer three one-week sessions — two for high school students and one for middle schoolers. Dr. Reginald Baptiste, the director of pre-health professions at the medical school, organizes the camp. When he was a teen, he went to a health professions magnet school in Houston — the first of its kind in the country. Today, he works to make sure Austin-area teens have their own opportunities to learn about careers in medicine. “We’re trying to find our next generation of health professionals,” Dr. Baptiste says. The camp introduces students to the world of medicine and gives them a glimpse of what it would be like to work in various health professions. All students who attend the summer camp are also invited to participate in year long programs. In one program, participants meet one Saturday a month on the medical school campus to hear speakers from different health professions. Students can also take advantage of SAT prep help and a chemistry enrichment course. The second program is a rigorous emergency medical responder course that provides a national certification. Campers are motivated because they understand they have a unique opportunity, Dr. Baptiste says. He’s seen firsthand how that opportunity is changing students’ lives. Spending time with the counselors and health professionals shows camp attendees the possibilities that exist for them in the medical fields. That’s especially important for low-income and minority students who might not have enough role models in health professions. If they choose to go into medicine eventually, they will help alleviate a lack of diversity that damages patient care. The program aims to attract students in Title 1 schools, who often have more obstacles and fewer opportunities to attend camps like this one. Last year was the first time that a tuition component was added to the programs. But 54 percent of campers still attended free of charge. “The ability to pay is never a barrier, even for the year long programs,” Dr. Baptiste says. Scholarships (which you can help support) are offered to all students accepted to the camps who cannot afford to attend. For campers who do go on to medical school, the hope is that they’ll choose Dell Med — which increases the odds that they will practice in Austin someday. The summer camp is just one of the ways that Dell Med is reinventing what a medical school can be. The curriculum of Dell Med was designed with community health in mind. Traditional medical schools might give students two to four weeks in a primary care setting. At Dell Med, however, students work with the same primary care physician for a full two years, which allows students to see the value of caring for the same patients over a longer period. The goal is that residents will stay in the community as primary care providers. Texas as a whole has a shortage of primary care physicians. And in Central Texas, areas with many low-income patients especially need more primary care providers. I’m excited to see the impact of these programs in Austin. And they’re just the tip of the iceberg of what’s going on at Dell Med. To keep up with the latest, check out the school’s news and events page or look for Dell Med on social media. Here’s where you come in, #MovementMakers. Did you know that National Doctor’s Day is on March 30th? Well, you can take action in honor of this day to lift others. If you know a high school or middle school student who excels in science or who you think could make the world better as a medical professional someday? Tell them about the Dell Med camp. Here’s some key information to share. Each session runs 8:30 a.m. – 4:30 p.m. Participating school districts include Austin Achieve Public Schools, Austin Independent School District, Del Valle ISD, Eanes ISD, IDEA Charter School, KIPP Public Charter Schools, Lake Travis ISD, Leander ISD, Manor ISD, Pflugerville ISD, Round Rock ISD, and Texas Empowerment Academy. There are also a limited number of openings for students outside of the participating districts. Campers are recommended by their school administrators, teachers, and counselors. More details about the application process are online so check the Dell Med website. Copyright (c) 2019 Williams Strategies, LLC. All rights reserved.